Chinese dance dates back nearly 5000 years. 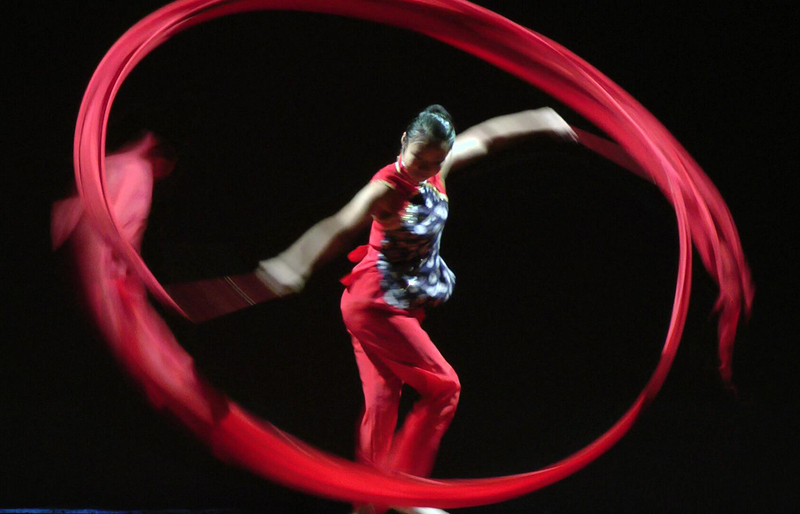 As in most cultures, Chinese dance is close to and reflective of daily life experiences and concerns. The dances can be divided into ceremonial (for praying to the gods for bountiful harvests), dramatic (for reporting and commemorating historical events), martial (for demonstrating fighting techniques), and agricultural (for celebrating nature and work). The dancers also use sophisticated props like silk banners, silk and feather fans, handkerchiefs, ribbons, and swords while dancing for the appropriate occasion. In old China, dancers belonged to the slave class and their chief function was to perform in the courts for royalty and the nobles. During the Tang Dynasty (618-906 A.D.) the famous Silk Road was often traveled by Indians, Persians and others who came to trade in silk. Buddhism thus found its way into China and had an enormous impact on Chinese culture. The Flying Apsara, a minor deity, plays music and is pictured in many murals from this period. The unique poses of the dancers represented in these murals influenced Chinese classical dancing. Like the United States, China is a nation of many different nationalities. Each has its own history, language and tradition, and maintains its own distinct customs and styles of dress. The Han make up the majority of China's population. Some of the larger minority groups are the Mongols, the Dai and the Miao.